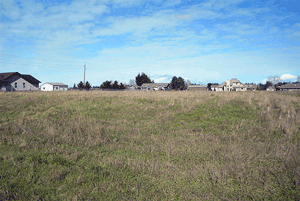 Lot 7 Equus Ln Lot 7 Erdman Acres Survey. Live in supreme elegance with breath taking 100 mile views of the Cascade Mountains, including spectacular snow covered Mount Baker, the famous Strait of Juan de Fuca, British Columbia including the crown jewel City of Victoria. 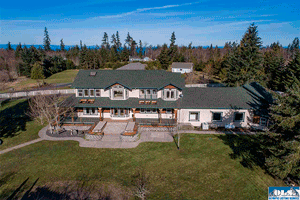 Located towards the top of Sequim’s coveted Bell Hill, this outstanding home was built by one of the area’s most highly regarded builders and designed so that almost all rooms benefit from the unsurpassed views. A WATERFRONT MASTERPIECE TO SEE! 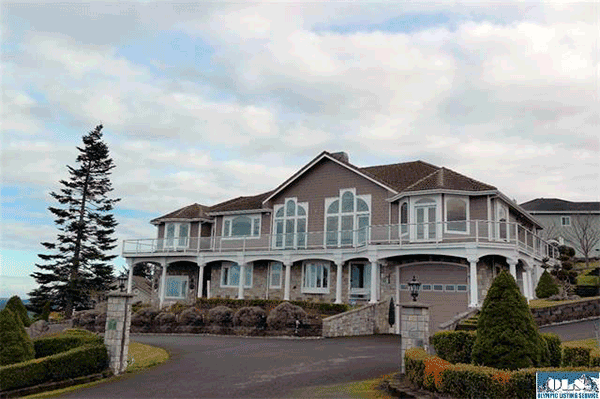 Custom built home w/breathtaking unobstructed views of Mt. Baker, Victoria & the Strait. 3 BR (all with attached en–suites), 3 fireplaces + wood burning stove, Acacia hardwood floors, steam shower, covered porch, 2nd story deck, 3 car garage w/bonus room. Spectacular property along the shores of the Strait of Juan de Fuca. 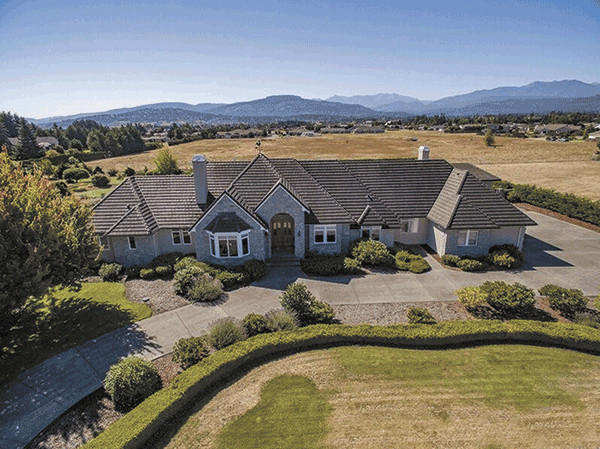 Custom–built home with breathtaking unobstructed views of Mt. Baker, Victoria and the open waters of the Strait. Features gourmet kitchen with island, 3 bedrooms (all with attached en–suites), office, 3 fireplaces and wood–burning stove, Acacia hardwood floors throughout, steam shower, covered porch, second story deck, 3–car garage with upstairs bonus room with 3/4 bathroom (use as bedroom, game room, office), and the list goes on... 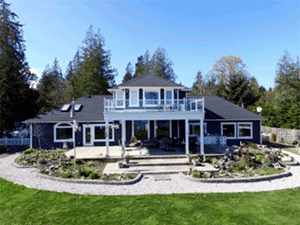 Stunning attention to detail all on 3.16 gorgeous acres. 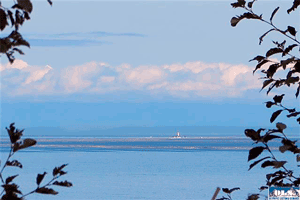 Incredible salt water views of the Strait, Dungeness Spit & Light House, Victoria & San Juan Islands. Property has 3 separate parcels & provides many opportunities to explore. 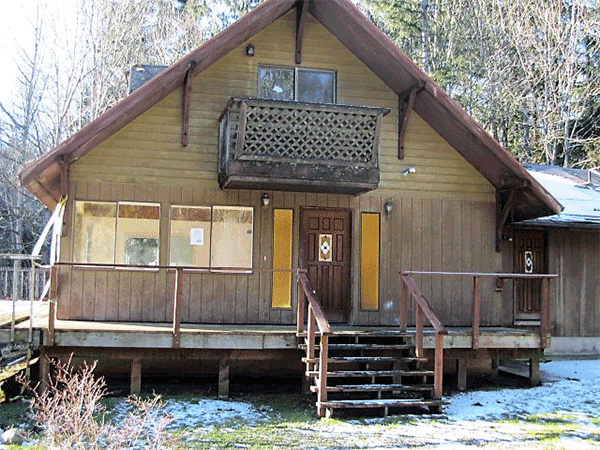 Could be used for family compound, investment property, multiple homes, B&B, vacation retreat and so much more! 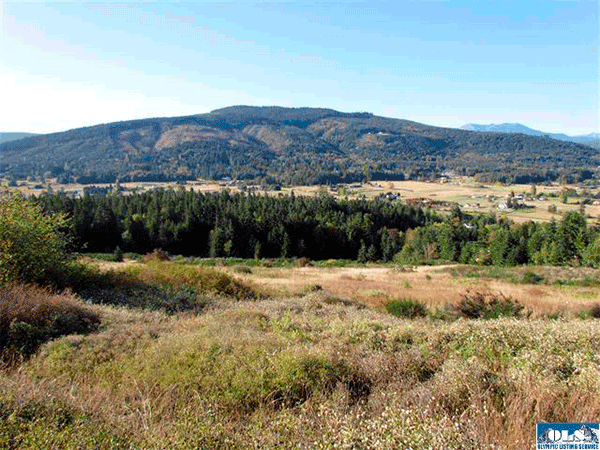 Includes 2 water front parcels at 2.5 ac, 2.37 ac & wooded 4.39 ac parcel with stunning mountain views. 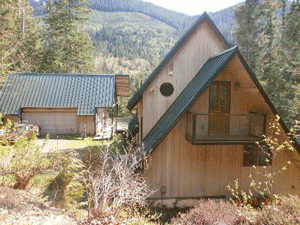 Property has PUD, 2 wells, irrigation & majestic stands of Cedar, Fir & Maple trees. 265+ FEET OF DISCOVERY BAY MEDIUM BANK SHORELINE! 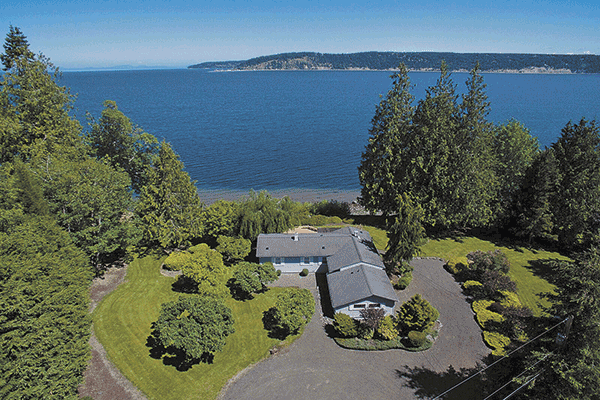 Casual elegance is found in this classic waterfront cottage. Sunrise to sunset views. Deeded tidelands easily accessible via sturdy stairway & uplands are well protected by massive stone seawall. This is a quality home with the best views around. 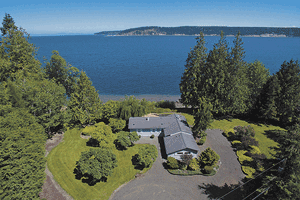 What more could your ask for You can see a water view from almost every room in the house. The newly remodeled kitchen boasts all new top of the line stainless steal appliances, designer granite counter tops and solid Maple cabinets. There are beautiful Maple wood floors with Swedish finish throughout the kitchen and dining area. And warm Cedar Vaulted Ceilings in the extra large living room. Come see this hidden beauty. 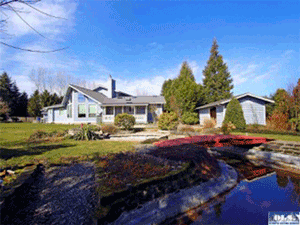 Incredible country home on 5 mountain view acres accessed via a tree–lined driveway! The living room features a cathedral window wall that provides a spectacular view of the Olympic Mountains to the south. 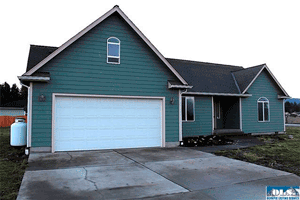 This 3 bedroom 3 bath home is all on one level except for the bonus room upstairs. The 1,216 sf garage allows both inside parking for two or three vehicles and a warm shop area for working on projects. The south two acres would be ideal for farm animals. There is room to build a barn or outbuildings. Garden area and Agnew Irrigation. Tranquility found moments from town. Make it a 1st/2nd home, B&B or special retreat. Each bedroom its own suite – Craftsman exterior meets rustic/serene interior – Kitchen w/open pantry designed for the chef & entertainer – Guest home foundation poured; water/power & septic hookups ready. Top some trees for a view of the Strait. 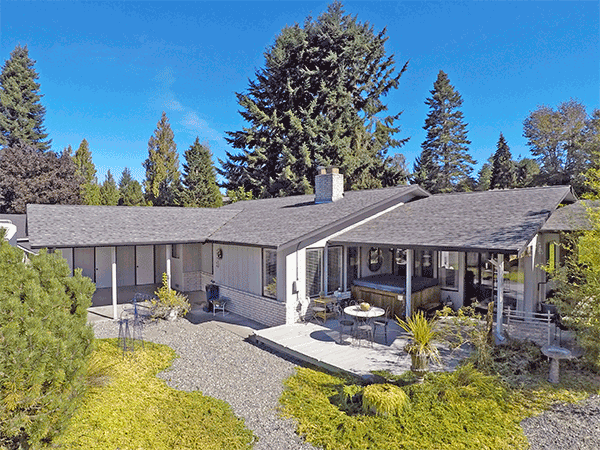 Exceptional appointments; open beam ceilings, exposed steel plate bar, sound system, radiant heat concrete floors – Next to DNR lands – See this home & fall in love! 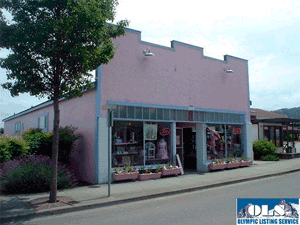 Large freestanding commercial building in vibrant Downtown Sequim. With the new City Hall across the street, adjacent to plenty of public parking and restrooms, it is a great location. Seasonal Open Air Market is held next door generating a lot of pedestrian traffic. 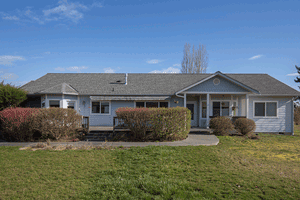 Current owner converted two units into one large space, could be split apart again. Vintage old wood floors, antique light fixtures and recent building upgrades make this old charmer functional and attractive. 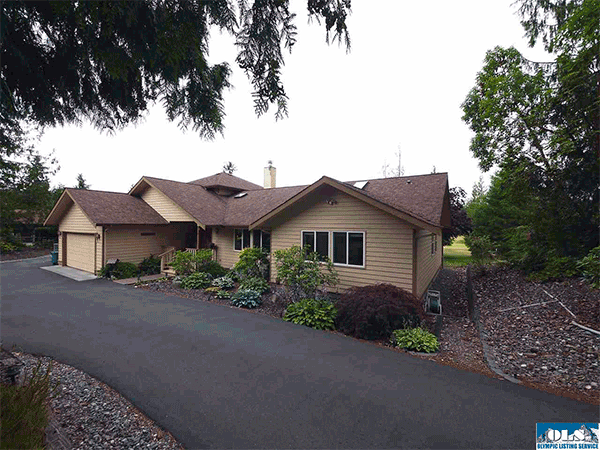 NW Contemporary Cedar home w/large 2 car attached garage w/shop & detached heated RV garage w/shop & greenhouse. Amazing yard w/2.3 acres landscaped & fruit trees w/irrigation. Garden area. Mountain View. Sunny large deck w/electronic awning. Bountiful Storage. Beautiful 2700 sqft home with beautiful landscaping & seasonal pond. Features include kitchen w/ nook & plenty of storage. Living room w/fireplace. Formal dining room. Master suite w/double sinks, separate shower, & walk in closet. Main & Master baths w/heated floors. Upper level w/ a large open room w/hardwood flooring & wet bar. Workshop off the garage plus a detached 12 X 28 RV garage. Great 3700 sqft home on 2.3 acres with pond, irrigation & a peaceful setting. This 2 level home w/daylight basement features country kitchen, living room w/fireplace, Master suite w/double sinks, soaking tub, & walk in closet. Full bath & bonus room on the upper level. ADA bath, guest quarters, and living room w/woodstove in the daylight basement. 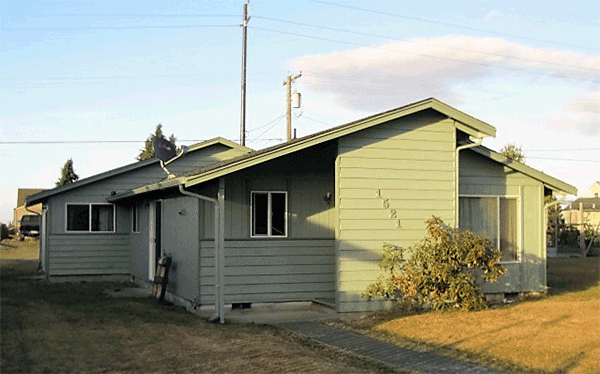 attached 2 car garage w/office or hobby room plus detached RV car port. Immaculate 3 bed/3 bath single level home surrounded by beautiful landscaping, berries & fruit on two city lots. 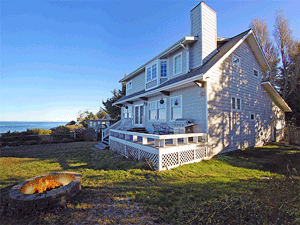 Propane fireplace in both the bright living room & family room that has sweeping salt–water views. Formal dining room w/hardwood floors off the tiled kitchen. Master suite has 2 closets, jetted tub & access to private center courtyard. Part of garage has been transformed into workshop/bonus room. 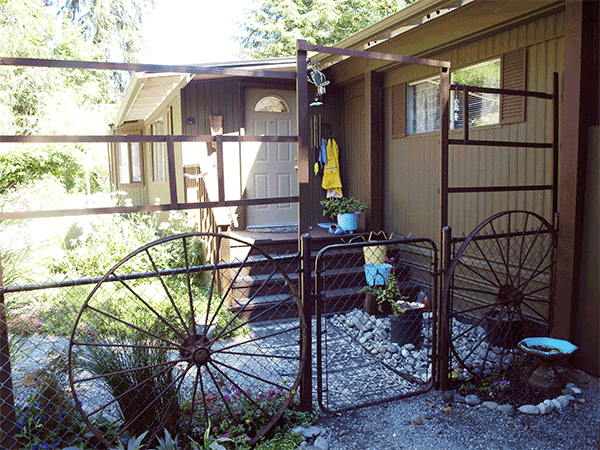 Detached carport offers additional parking. Space to park RV in driveway. 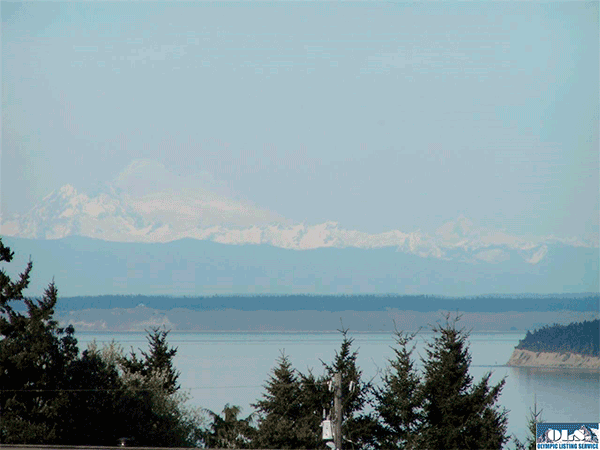 Over 8 acres located on the south side of Sequim yet still within the city limits and offers views of the Strait, shipping lanes, islands, the city, & the Olympic mountains. 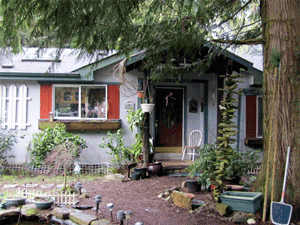 This property would make a greatestate or could be subdivided. City water and sewer are available. Power is to the property. 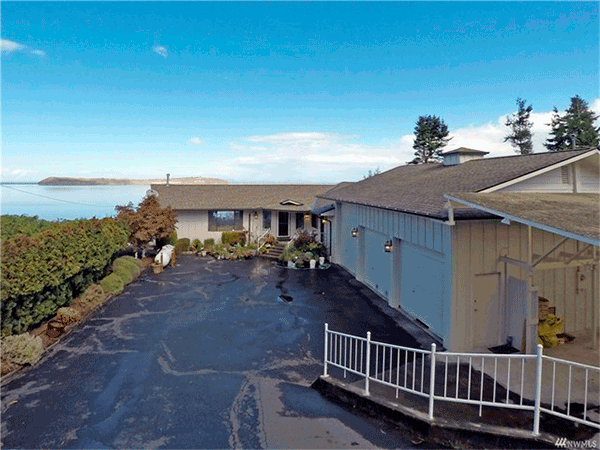 Sweeping salt–water views from this beautifully remodeled 3 bed/2 bath home! New wiring & plumbing. Kitchen has granite counter tops & new soft–close cabinets. Rich cherry flooring upstairs. Fireplace in both the living room & spacious downstairs master suite w/ sitting room, french doors, walk–in closet & remodeled bath. The northern exposure deck w/ covered bbq shelter, heaters & fire pit is a great space for entertaining! Flagstone patio, hot tub, & RV parking in back! This 4 bed, 2 bath multi–story home has refinished hardwood floors in the bedrooms and newer laminate throughout. Main level – kitchen, living room, sunroom/library, and full bath. 2nd floor – 4 beds and full bath. 3rd level is 486 sq. ft. of open space with unlimited uses. Beautiful 3 br, 2 ba, home on 1 acre with fenced in yard & great Mountain Views. Features include kitchen w/tile flooring. Living & dining areas w/hardwood flooring. Master suite w/jetted tub, walk in closet & separate shower. 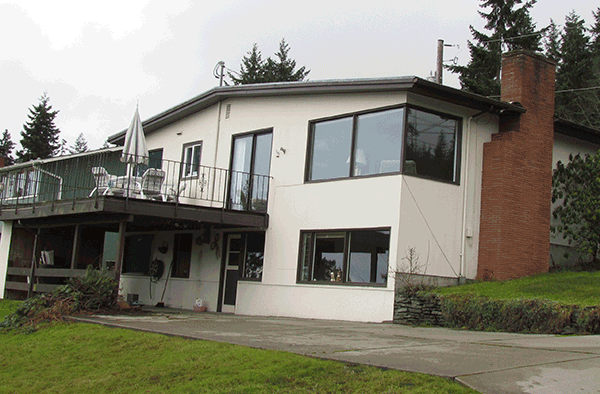 Heat Pump, Attached 2 car garage plus carport & irrigation water. 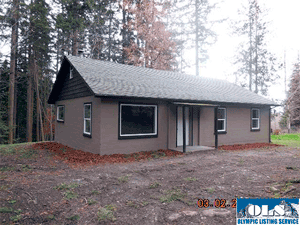 Comfortable Cottage–like home on one acre lot. Home has great sunsets, the deer on property, quiet safe neighborhood & on a private dead–end road! Near the Dungeness Spit, Lighthouse & the Dungeness National Wildlife Refuge. 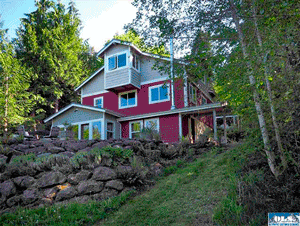 COMFORTABLE COTTAGE–LIKE HOME ON A ONE ACRE PARCEL. 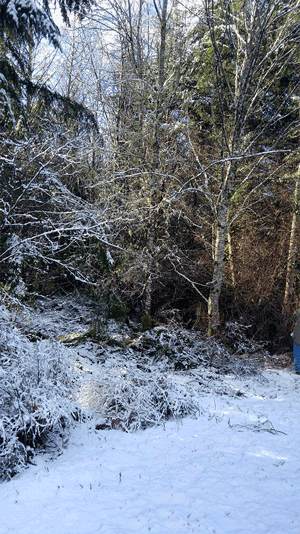 Two bedrooms and 1 bathroom with wood stove. The unique benefits at this house: great sunsets, the deer on property, quiet neighborhood, private dead–end road! 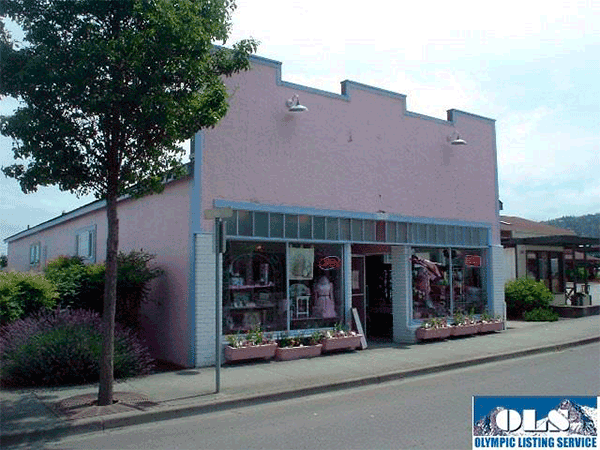 Enjoy all the amenities of being in the Olympic Rain Shadow. The North Olympic Peninsula is base for a variety of outdoor activities such as bicycling, kayaking, fishing, and hiking. Near the Dungeness Spit and Lighthouse & the Dungeness National Wildlife Refuge. This home has successfully been a VRBO for 5 years. 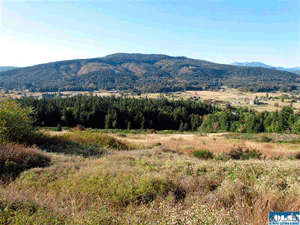 There are two (2) adjacent 20+– acre parcels being offered together. This private, end of the road property is just a couple minutes from Lake Crescent, one of the most pristine lakes in the country and is 600 feet deep with crystal clear water. 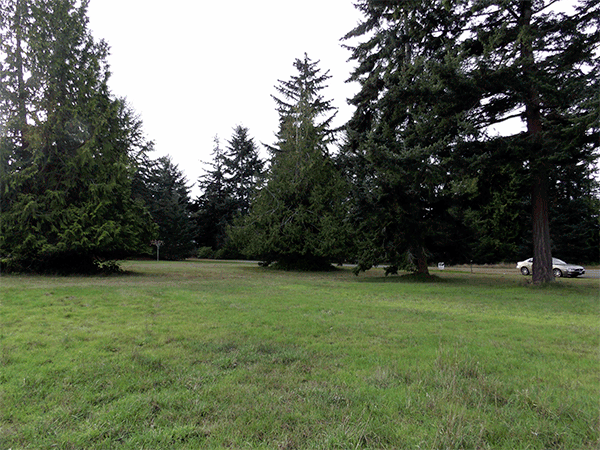 A beautiful mix of a variety of trees provide total privacy and this land backs up to DNR land. 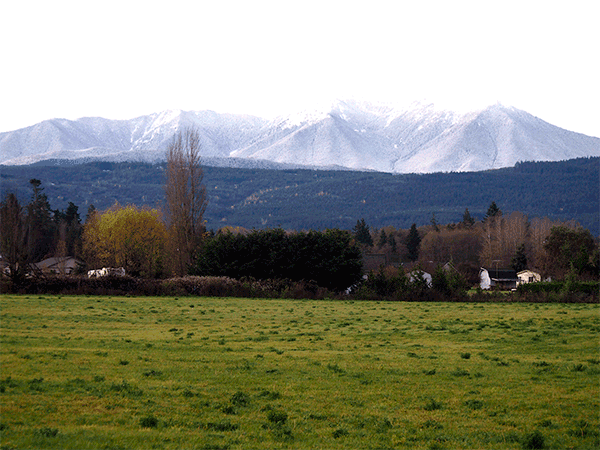 Mountain views are possible with some selective logging. Many possible building sites. This could be a magnificent estate quality property. Lots of wildlife abound. Brookstone Beauty, turn key ready for relaxing living in this 3bd 2ba home. Stainless Steel appliances, Granite countertops in kitchen, Tile countertops in bathrooms, Real hard wood floors, propane fireplace, Master bedroom boasts double doors with an adjoining large master bathroom and walk in closet. Large pantry with plenty of storage. Heated insulated garage, and an enclosed back patio. All appliances to stay and propane tank is owned, alarm system and many more extras. 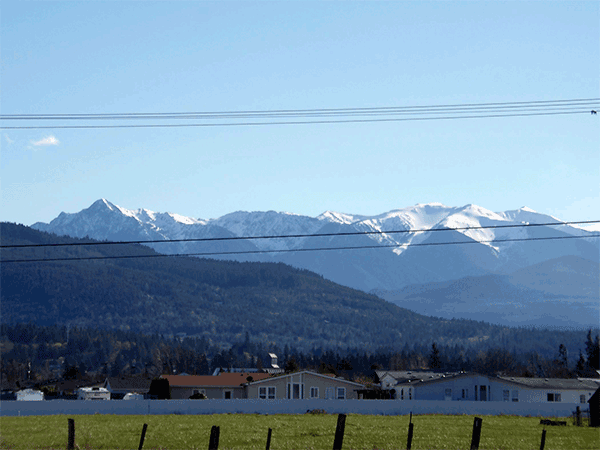 Olympic Peninsula living at its finest! Spacious 3 bed 2 bath manufactured home right outside of Joyce. Open layout in living room w/ vaulted & beamed ceilings, spacious kitchen, formal dining, French doors, skylights, and Master Suite. 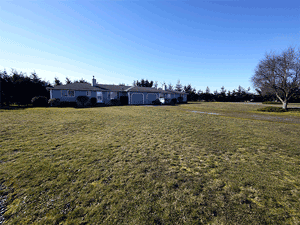 A LOT TO OFFER 2003 manufactured home on 1.48 acre corner parcel. Recently upgraded with granite counters, hardwood floors & heat pump. 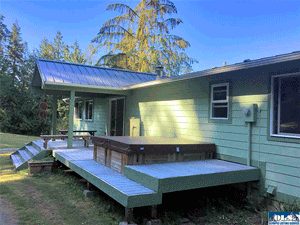 Spacious 2132’ of living space with attached 2 car garage + detached 1200’ shop with bath & loft + RV carport with septic, power & water. This is a move in ready turn key 3bd 2ba 1857 sqft home, on the 5th fairway at the Cedars of Dungeness Golf Course, one of the premier courses in the Pacific Northwest witha club house and Stymies restaurant. 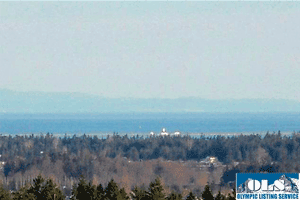 Great mountain view of the Olympic Mountains also. This home boasts hardwood floors on the main living area, newer high end appliances, countertops and cabinets. Large master suite w/double sinks and walk–in closet. Downstairs is a great exercise room or media room. Easy care yard in a super neighborhood in a cul–de–sac. Live in one side and rent the other or rent both halves. This duplex condo features two 1204 sqft 2br, 2ba, units with nice kitchens, open living & dining area, large laundry rooms, patios & garages. Great location just outside of town with easy access to town. 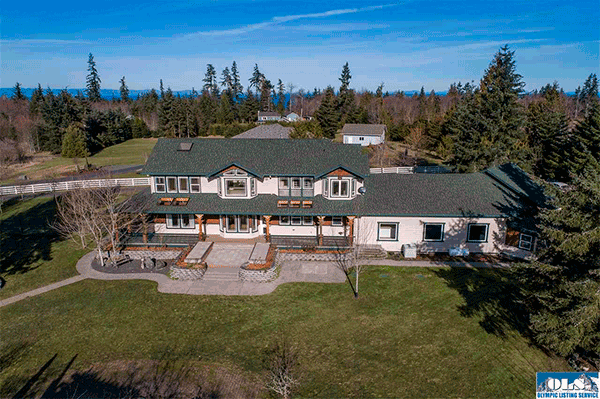 This home sits on 1.74 acres with majestic views of the Olympic Mountains and has direct access to the Olympic Discovery Trail from your fenced and gated back yard. 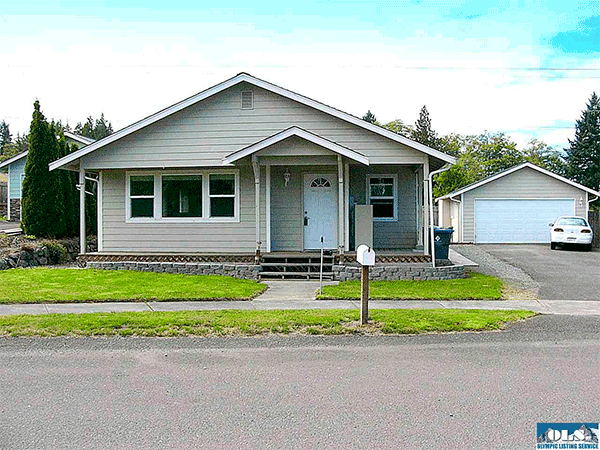 Walking distance to town, this spacious 2 bedroom, 2 bath home features tile countertops in kitchen, 9’ coffered ceilings, propane fireplace and two bonus rooms which are currently used as offices. 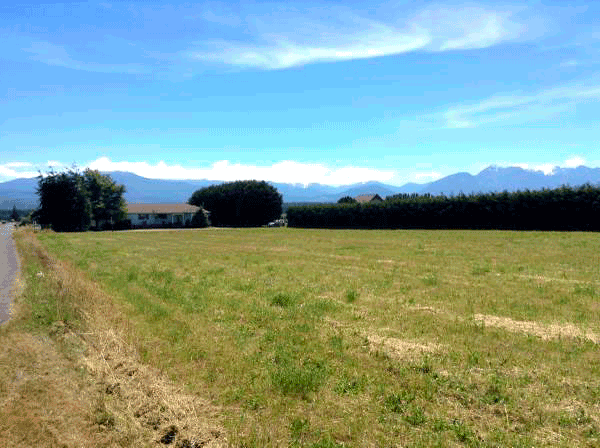 The property has apple, cheery & plum trees and has plenty of space for a garden or animals. 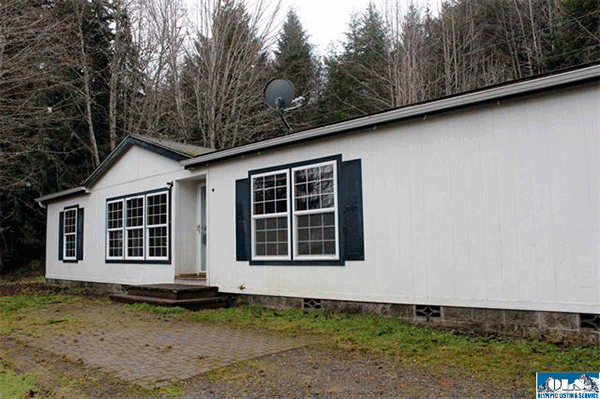 2.7 wooded acres surround this spacious, 2bd 2ba home. 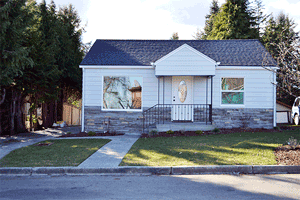 Completely remodeled in ’94 and updated in ’16, the fully finished, 924sf basement opens up a world of possibilities. 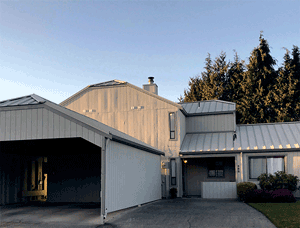 Massive, 4–car garage boasts three levels plus a mechanic’s pit. Add the beauty of Little River frontage, and you have a perfect balance. 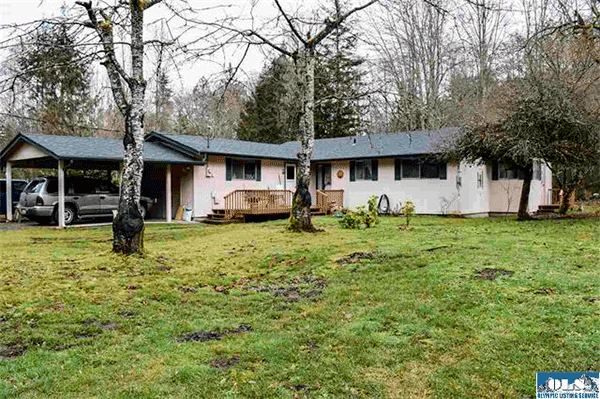 Nestled on 4+ acres, this 2 bed 1 <00BE> bath home lies in one of Port Angeles’s loveliest neighborhoods and will make you want to call this house your home! 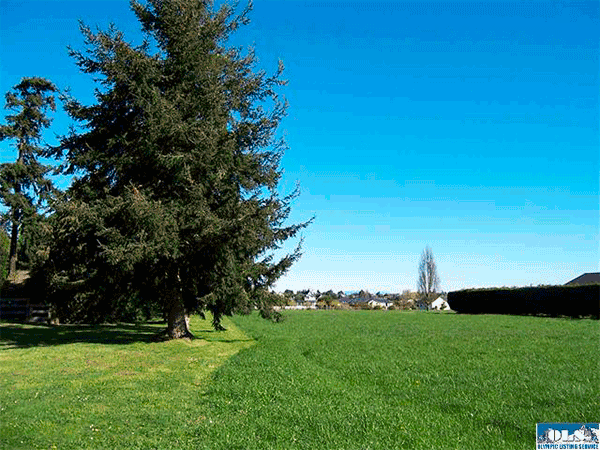 Great land division possibilities, close to town and the Peninsula Golf Course. Near the base of Lost Mountain Rd, this 4bd, 3ba home features 2 easily maintained acres, a remodeled kitchen with granite counter tops, natural stone master bath, and ample storage space. The fourth bedroom has its own, private entrance and full bathroom. A one–car garage opens to reveal a large workshop area and the secluded hot tub rounds this out to make for a great opportunity. 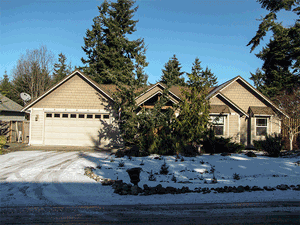 · On 10th Fairway, 3 BD, 3 BA. 2016 SF. First home ever built in a desirable 4 Season’s Ranch in PA! 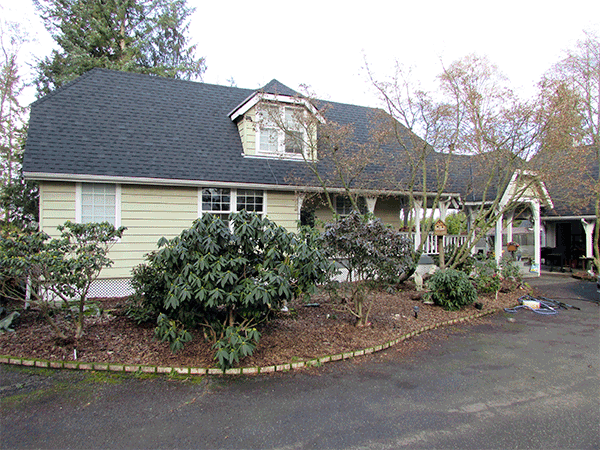 1944 home with incredible charm, 2 story w/basement, 2.59 acres with a bubbling Morse Creek on west side of property, 3592 sq ft, 4 bed, 2 baths, 3 fireplaces, tongue–and–groove real cedar boards on walls, arched doorways and more. 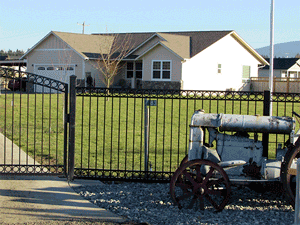 4 Season’s Ranch offers amenities like: golf course, swimming pool, community beach, club house, horse barn. A Must See to Appreciate! Private treed land will offer wonderful sweeping water view. Boarders DNR land on west. The western half of the property is both build able and relatively level. 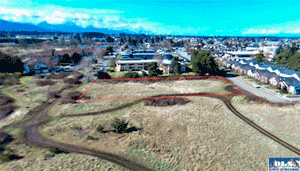 More usable land on this parcel than most in the sub division. Well installed on southern end of property. 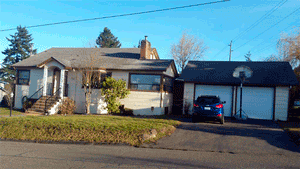 Very nice well kept three bd two ba home sitting on over an acre close to town. 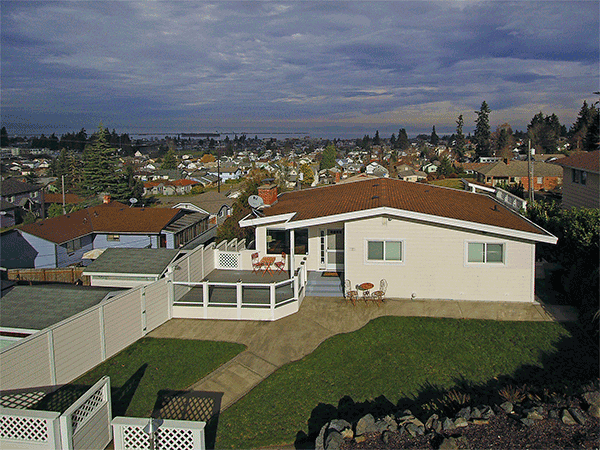 Inviting home with nice back deck and plenty of elbow room. Beautifully landscaped with garden and extended fruit orchard with fruit trees bearing peaches, apricots, plumbs, and apple varieties Perfect for active retirement, family life, or investment. 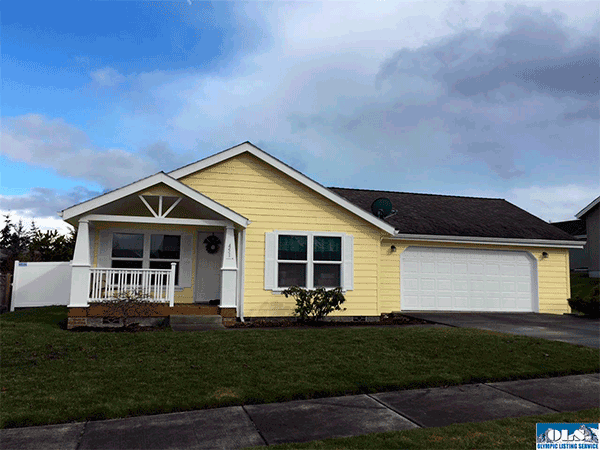 This charming 2016 custom 3bd 2ba home with peak–a–boo view features a bright & open floor plan, stainless appliances w/ granite countertops in kitchen and both baths. The large master bedroom with private bath features a soaking tub and separate walk–in shower. Enjoy all that Diamond Point has to offer: kayaking, crabbing, fishing or simply beachcombing for miles from your private community beach. Miller Peninsula State Park is close by with miles of hiking and horse trails. 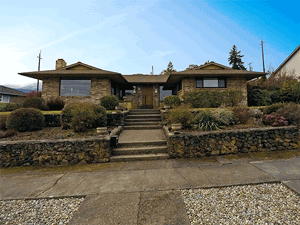 Comfortable, warm, and inviting Rambler sits on a good .40 acres. Great for the gardeners, pet owner and for play space with very little traffic to worry about on Viking Way. Great Mountain view from living room and back deck! 3BD, 2BA ranch on 20 acres. Land division possibilities and plenty of room to roam. Enjoy the creek and serene environment. 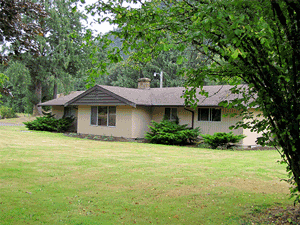 Close to town and near Lake Sutherland, Lake Crescent, the Hot Springs and more. Beautiful newer 3 br., 2 ba., home located in a desirable neighborhood close to the schools and shopping. The home features Granite counter tops in the kitchen. Crown molding in the main living area. Wood wrapped windows. 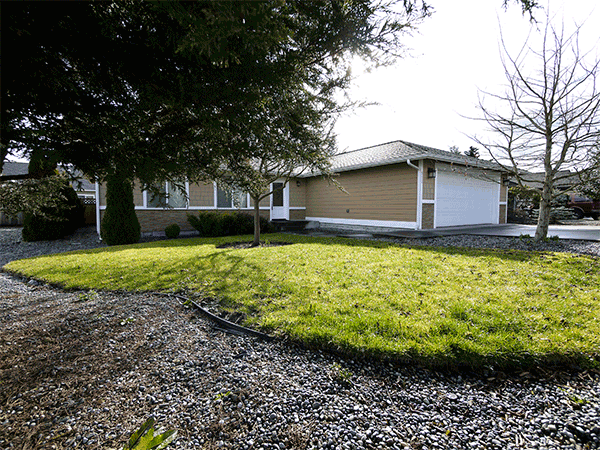 Nice sized garage plus a fenced in back yard. 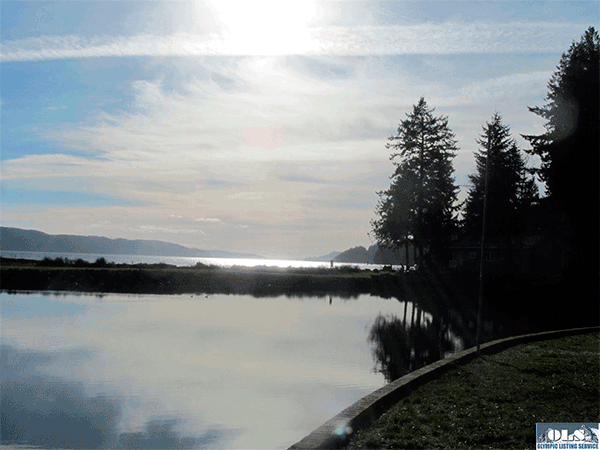 Walk the community beach, or float in the clean lagoon, from the yard of your Hood Canal home! 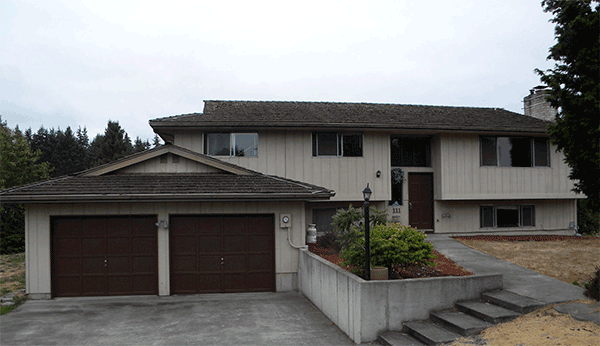 Private & quiet 2002 3 level home w/detached dbl garage has deck & balcony. 2 bedrooms, den, office, rec room, 3 baths, kitchen, laundry, Summer kitchen, lots of storage! Catch your own clams, oysters, crab, & shrimp! Wonderful home & setting! Private and Secluded! Immaculate manufactured triple wide home on 2.5 acres w/ add’l 2.5 acres adjacent. 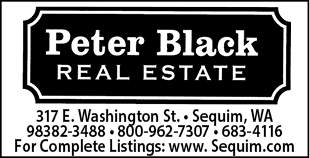 Located in highly sought out Black Diamond area. New roof installed in 2016! Beautiful 2 plus bedroom rambler in a great neighborhood. 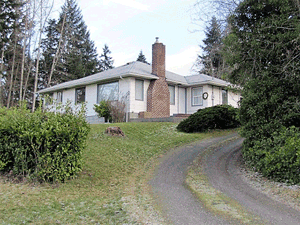 Home has an open floor plan, propane fireplace and large master suite with a full bath. The easy care yard is fenced with a fire pit, patio and raised beds for your gardening. This home is in immaculate condition and is ready for you. A beautiful 5.9 acre parcel located on a small private lake with a wooded surrounding . 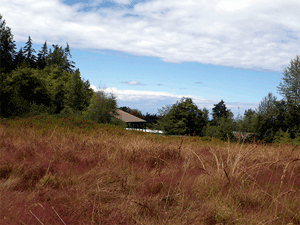 A variety of waterfowl & upland birds can be seen from this property. 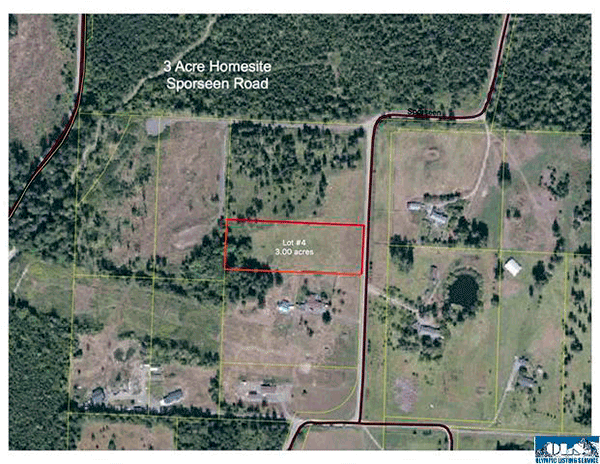 This parcel offers around 1 acre of useable land with a dock, 1 car garage, storage building, & gazebo already in place. Power, well, phone, & 3 br. septic have been installed. The building site is well suited for a daylight basement style home. 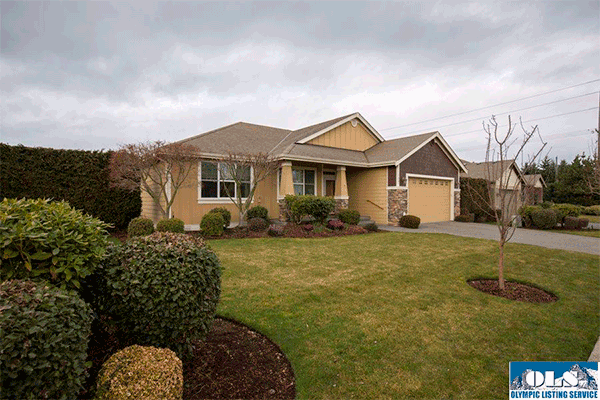 One owner home meticulously maintained in a wonderful & quiet neighborhood. Vaulted ceiling in the family room with a wall of windows & propane fireplace. Family room is open to the kitchen & dining area. Cozy living room/sitting area. All windows & closets wood wrapped, bench window seat in south facing bedroom & pocket doors to bath & laundry area. Large master bedroom, bath & walk–in closet. Laminate floor entry, kitchen & dining. Heat Pump. Garden area & shed, trees for privacy, all fenced backyard. 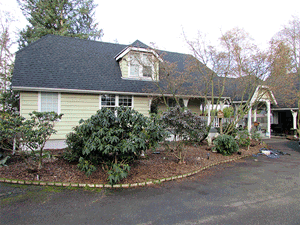 Enjoy a BBQ in the private, fenced backyard w/tall evergreens for shade. Inside vaulted ceilings, handicap access, laminate floors, & a kitchen w/loads of storage & counter space is why this owner fell in love with it, but a growing family calls for a change. Built in 2003, this is home is in like new condition, but more affordable. Great Location! 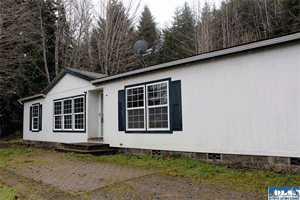 This 3 bedroom 2 bath manufactured home is close to town and within walking distance to Carrie Blake Park and the Discovery Trail. Open concept with vaulted ceilings and covered porch entry. Fully fenced back yard adds privacy. Master bath features a walk–in shower and separate soaking tub. 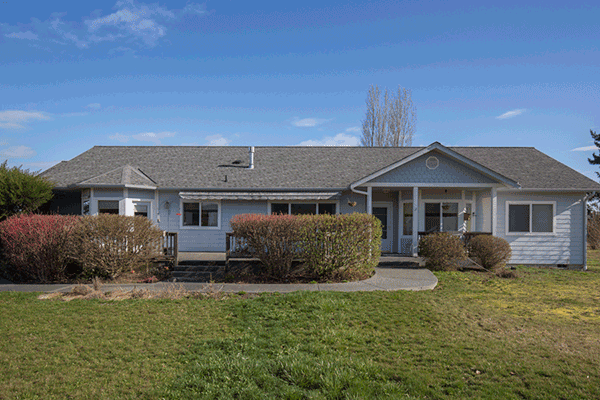 The course (plus swimming pool, clubhouse, & walking trails along the river) are all yours as the owner of this completely remodeled rambler in Dungeness Meadows with 2 BR 2 BA. Rear deck overlooks the tranquil golf course setting. Low HOA dues also includes water. 2232 Sq. 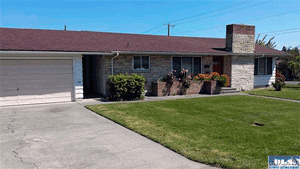 Ft. well cared for Del Guzzi home located in quiet neighborhood. Enjoy the spectacular views of the Straits from the large living room windows or the second level deck! Call Today! – Wonderful location adjacent to Olympic Medical Center, close to the Discovery Trail & waterfront. Wood burning fireplaces on each level, 2.75 Baths. Good shape, EZ maint. 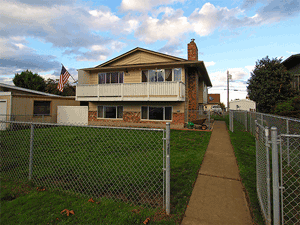 yard, 3 BR + Rec room & Bonus rooms. City zoned commercial. 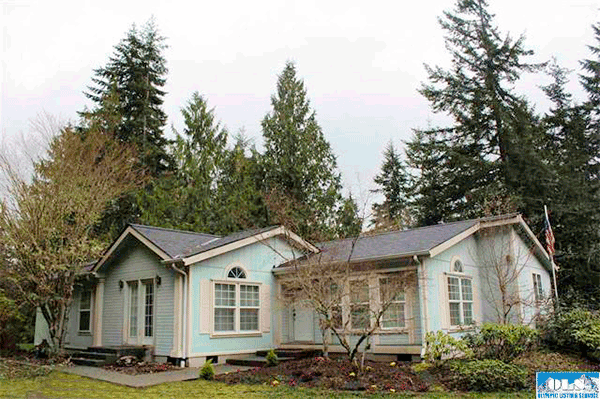 3 BR, 2 BA lovingly remodeled into an adorable show piece! New heat pump, new kitchen, new bathrooms are only the beginning! 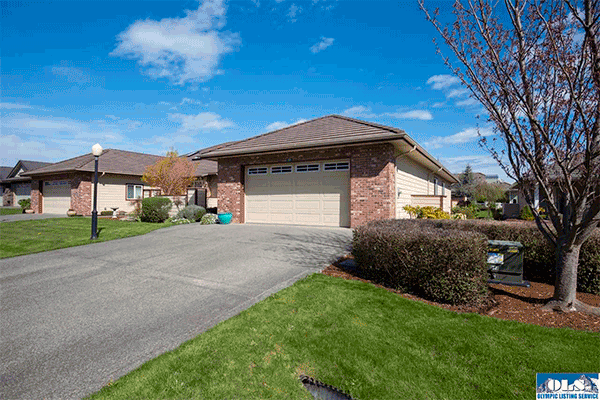 Expertly landscaped & fully fenced back yard. Detached garage. Must see home w/exacting attention to detail. Tucked away far far up Eden Valley Road. Private & Secluded. The layout of the 3 bedroom, 1.5 bath home is stylish and offers the buyer an opportunity to exercise their creativity to cosmetic enhancement. Solid 2 bed/1 bath home with great potential located on a large corner lot in a nice neighborhood! Plumbing & electrical have been updated. Hardwood floors under the carpeting. 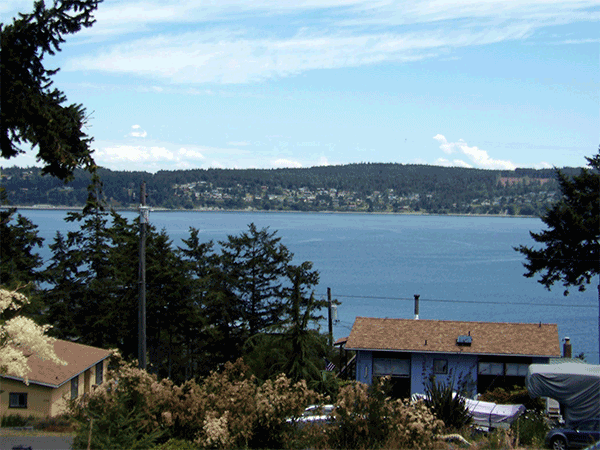 Living room has a propane insert & a peek–a–boo view of the Strait. Downstairs garage & partially finished basement w/wood burning fireplace. It could be transformed into a spacious family room or left as is for lots of storage space. Extra parking off the back alley. Apple, plum & cherry trees in the yard! 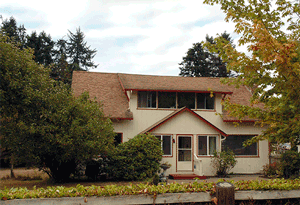 Mountain views enhance this cozy, one level 3 bed 2 bath home on the west side of Port Angeles. Great Location and close to town and amenities. 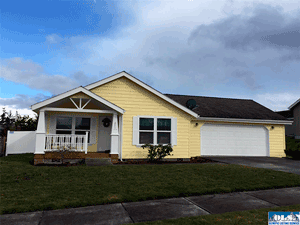 Home features a covered porch entry, fireplace in living room to keep you warm & cozy and double car garage. 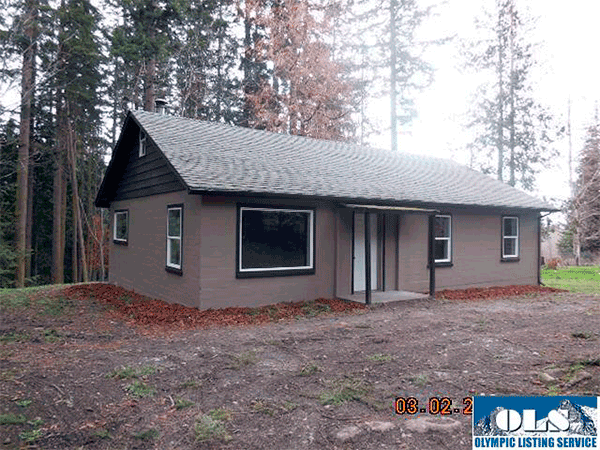 Wonderful 3bd 2ba 1528 sqft manufactured home in the historical McFarland Farm community, with two ponds, 13 fruit trees, green house and a shop that is 864 sq. ft. with 220 volts. 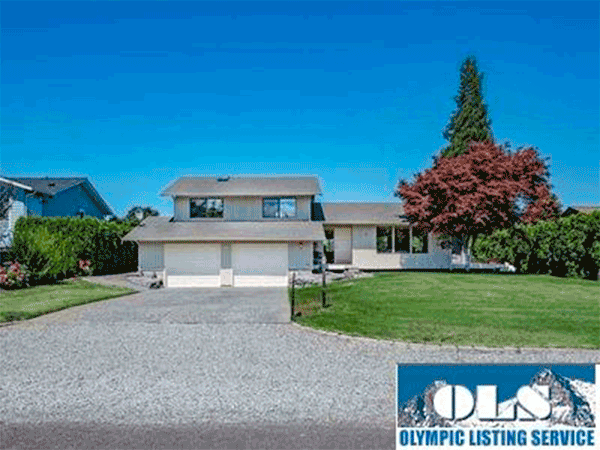 The home boasts a super mountain view of the Olympic Mountains. The home needs upgrading( floor coverings, paint and appliances). Great floor plan with the master at one end and the other two bedrooms at the other end, common area in the middle. 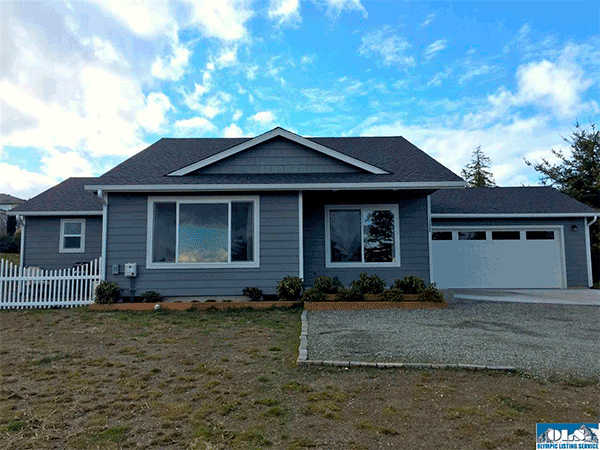 Great location with all the amenities of Sequim in walking distance, cozy 4 bd 2ba 1378 sqft home with new laminate floors. 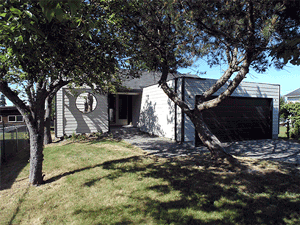 A concrete driveway pulls up to a detached two car garage. Beautifully remodeled 3 bed 2 bath home with awesome bonus rooms upstairs. 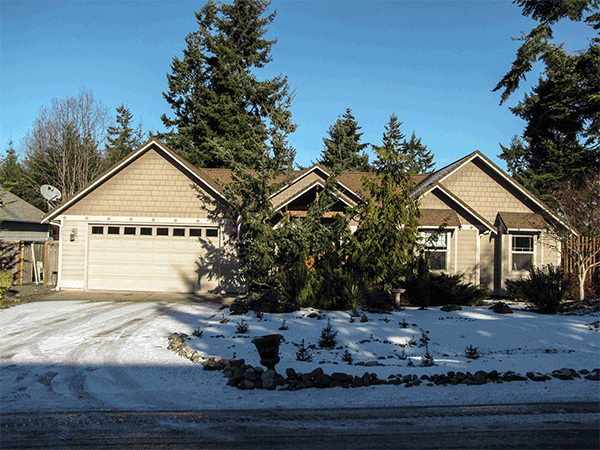 Conveniently located between Sequim and Discovery Bay, this home is on acreage. New beautiful laminate flooring through–out, all new interior paint, new carpeting. Open floor plan. This is NOT a drive by. The interior is a wonderful surprise! Year round creek runs along the west border. Property can be accessed from county road to the North, per owner. Must see to believe this awesome house and pristine land! 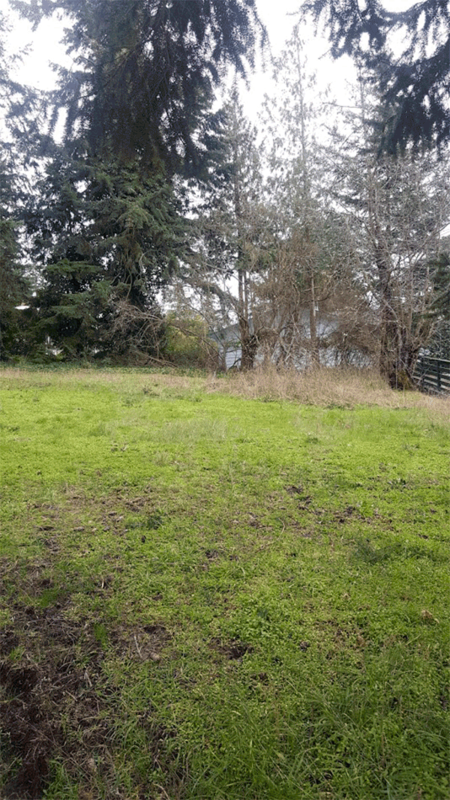 Beautiful flat easy to work with 5 acre pastureland parcel locate just outside the city limits with easy access to the Discovery trail & Rail Road Bridge Park. Power, phone, & drilled well are on the property. A septic system is needed. Irrigation water is available to the parcel. 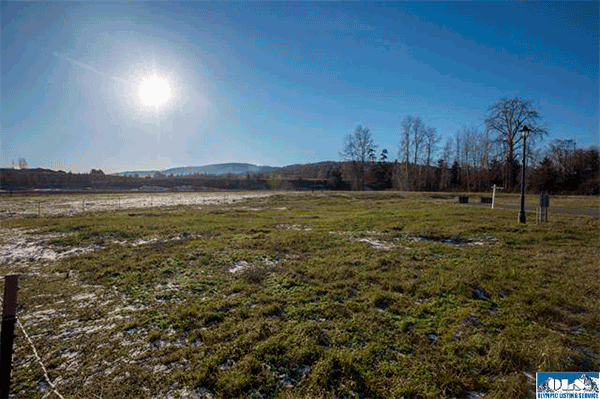 3 acre parcel in beautiful Happy Valley. Ready to build. Power and community well water to property. Spring fed pond on southwest corner of property. Water mitigation fee already paid. Quiet neighborhood, close to town. 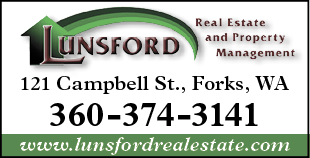 Lot adjacent to 200 acres of state forest land. Nestled among trees in a quiet neighborhood that is convenient to shopping, professional & medical offices and restaurants, this 2 bdrm/ 1.5 baths condo is move–in ready. Dining area adjoins private patio. Surprising amount of storage: pantry, coat closet, linen closet for each bathroom, storage room in carport, walk–in closet & dbl closet in master suite. Nice light interior walls and window coverings & light appliances & counters. Living room has brick wood burning fireplace. Both bedrooms are upstairs. Cute 2 bedroom 1 bath turn–key home nestled on a large city lot with peak–a–boo views of the Harbor and Olympic Mountains. 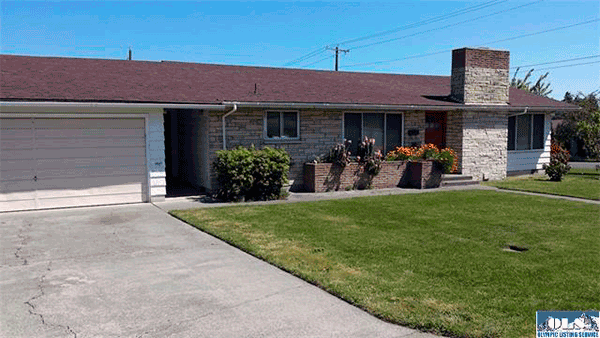 Great central location, close to school, shopping, downtown and walking distance to the Peninsula College. Immaculate 3 bedroom manufactured home on .76 acres. Open concept layout, well designed kitchen w/ island, formal dining, attractive & open great room – great for entertaining. Master Suite w/ soaking tub & walk–in closet. 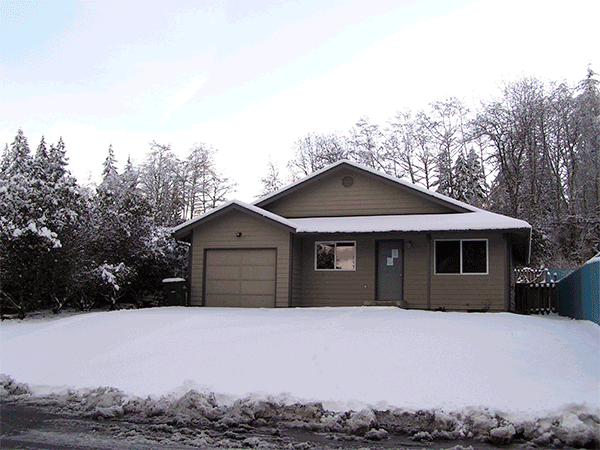 Downsizing, snow birding, looking for a starter home Here it is, clean with great recent remodels: new flooring, kitchen cabinets, new appliances, trims, fixtures etc. 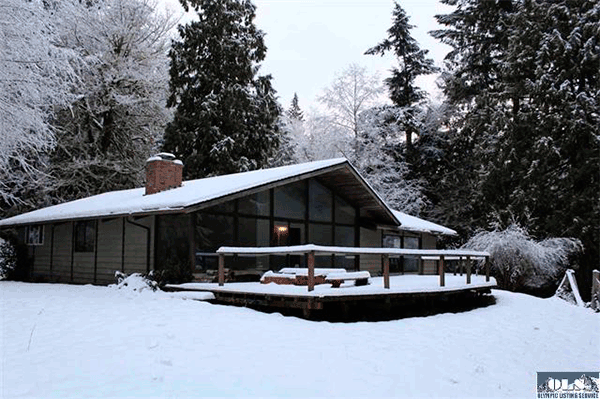 Large front room w/ big windows and a small water view, bright kitchen w/ a cozy eat–in area, 2 bedrooms/ 2 baths, walk in closet in master suite. Basement ready to be finished with fantastic storage space. 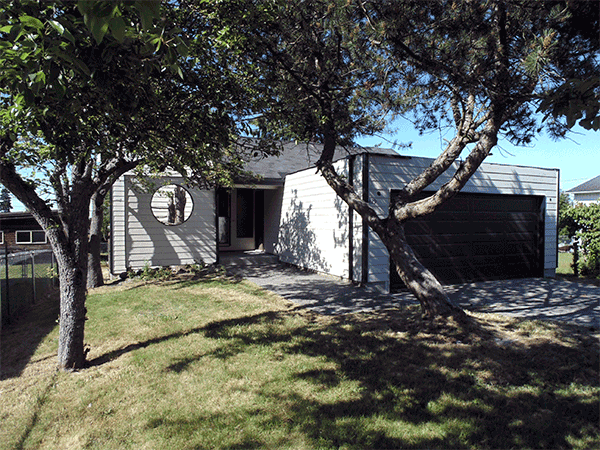 New roof and low maintenance landscaping & fire–pit in back. Convenient west side of town location! 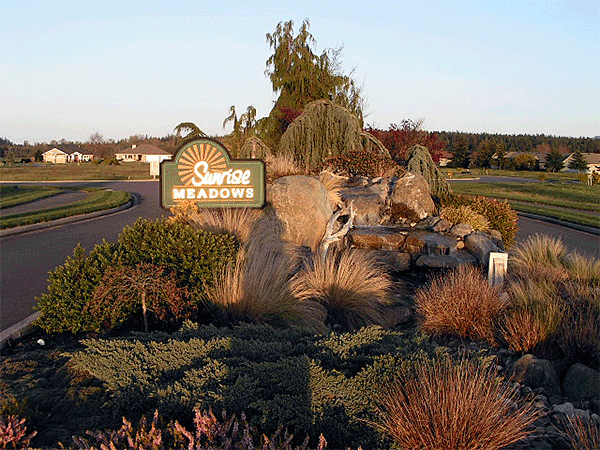 Sit by the fire pit and enjoy the sounds of Morse Creek as you live in this beautifully maintained home! You’ll love the open floor plan, updated kitchen, cozy fireplace, and country setting with the convenience of being close to town. 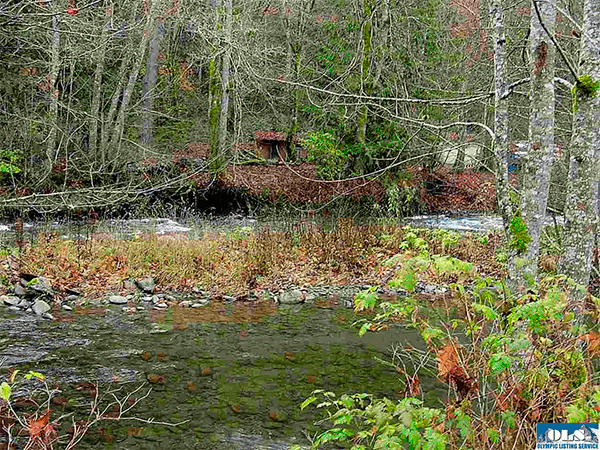 The backyard feels like a private retreat with mature trees and the creek running along the back. There are many upgrades including a fireplace insert, newer decks, built–ins, and additional storage in this charming home. 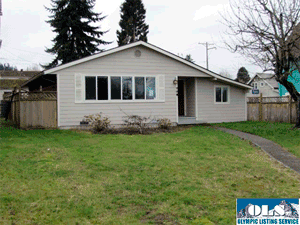 A little TLC will go a long way with this 3 bedroom 1 bath 1257 square foot home. 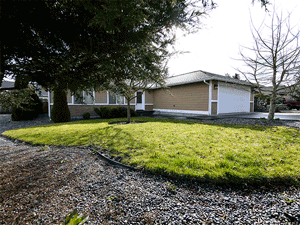 This home has a partially fenced backyard and is centrally located in Port Angeles. Property is being sold AS IS. Outstanding Multi–family development opportunity on this site located in the heart of Sequim. Easy walking distance to downtown. 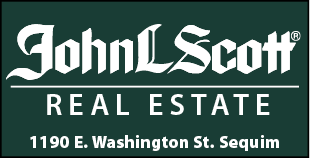 Zoned S–MU–1, city water and sewer. Peace Abounds Enjoy sunrises & sunsets over the Olympic Mountains. 3.25 acres of pasture open the possibilities for a hobby farm, home business, or try your luck growing lavender. No CC&Rs to restrict your activates. 2 wells to draw water from, 3 BR septic installed, plus irrigation rights. 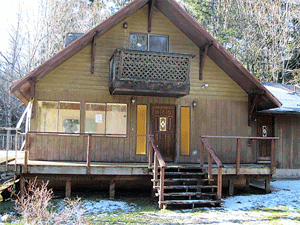 Use the cabin for storage or get a permit for occupancy. Great 5 acre parcel located in the Carlsborg area with pasture, wild roses & mature trees. This slightly sloping parcel offers several good building sites to choose from. This would be a good parcel for raising a few farm animalsand or raising you own garden. Power, phone, & community water are available along the road. A septic system is needed. 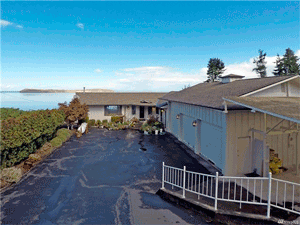 Plenty of space and located right on E Hwy 101 PLUS a 378 SQ FT outbuilding and detached 850 SQ FT outbuilding for add’l storage. NEW Tile, NEW Plumbing, NEW Heat System and NEW Electrical Wiring in 2005!!! 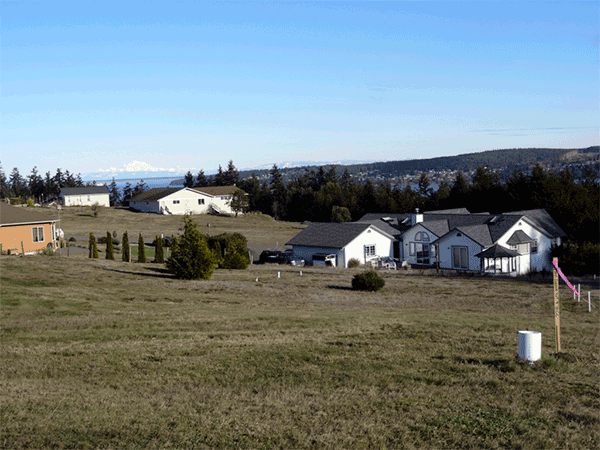 Wonderful 5 acres in a very quiet beautiful area. Come make your dreams come true. 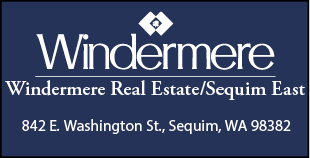 Seller had the timber evaluated by a local firm at $13,000, buyer to verify to their satisfaction. Close to Panorama Vista Waterfront Park, Seven Cedars, Sequim and Port Townsend. Soils registration has been completed, the property will allow for Glendon Biofilter, Mound or the Oscar Loweflow system. Mostly wooded waterfront building lot on the bluff in the Panorama Vista subdivision overlooking the Strait of Juan De Fuca. 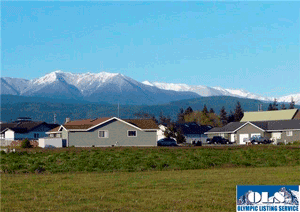 The lot is in a secluded and peaceful area and around 20 minute drive from down town Sequim. Power, water, and phone are available to the lot. The previous owner had house plans developed for the lot and will include them in the sale of the lot. Private and serene 2+ acre property and home with detached garage/shop. Located between Port Angeles and Joyce. Home is in poor condition and is to be sold as is. Crescent water share is included. 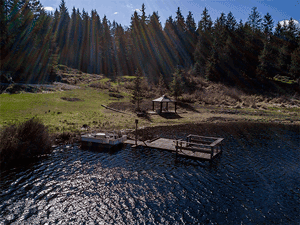 Beautiful 5 acre parcel perched nicely on a hill to maximize the water view. Private road in, building site has already been cleared. Quiet rural location, just off of Mt. 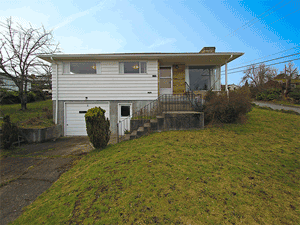 Pleasant Rd so extremely close to town and all amenities. 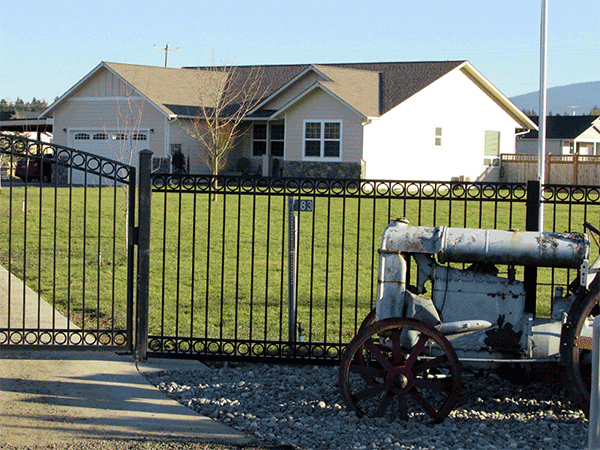 Lot has a new well installed and septic registration approved for a 3–bedroom home. 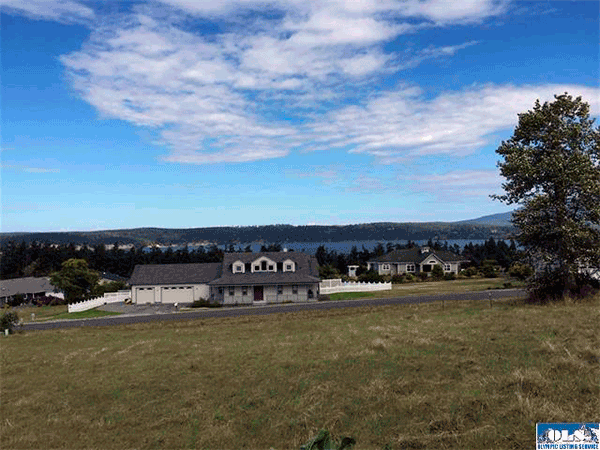 BEAUTIFUL WATER VIEW LOT, overlooking Sequim Bay. Nice neighborhood with fine homes. Septic is needed and a height restriction is in the deed. 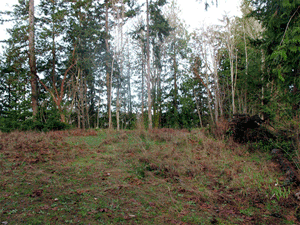 Plenty of room on this sloping lot to build your dream home. 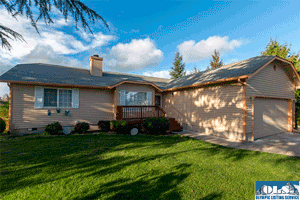 Minutes from the John Wayne Marina and a quick drive to town for shopping. 2.79 amazing acres in The Lake of the Hills Estates! Just minutes from sunny sequim. Enjoy the southern exposure while taking in the beautiful views of Happy Valley, the surrounding mountains, and even a partial water view! at Sunshine Acres is gently sloped and partially treed. Power, water, & phone to the property. CC & R’s to protect your investment. Peaceful community is great for walking & enjoying life! Ask TOM about. 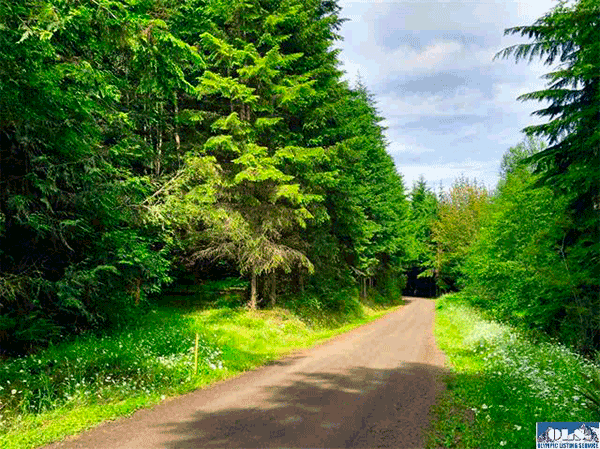 Glorious views, outstanding location, covenants to protect your investment, paved streets, underground utilities, combine to make this a fine building site. 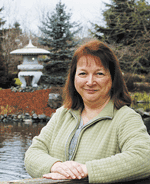 Water and sewer fee paid. 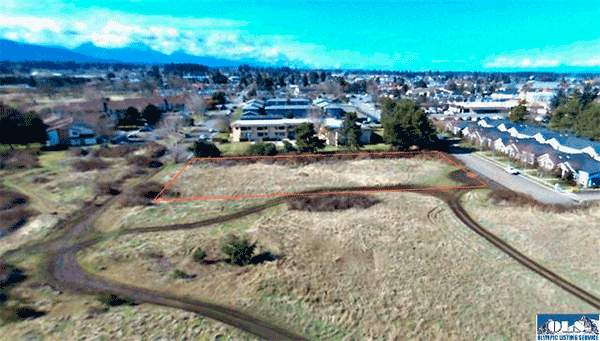 Capital facilities charge will need paying once buyer decides to build. The views at this time of year are obscured of the water and the mountains due to the clouds. There are a couple of “benches” on this lot which offer an opportunity to position the home site to maximize the views. 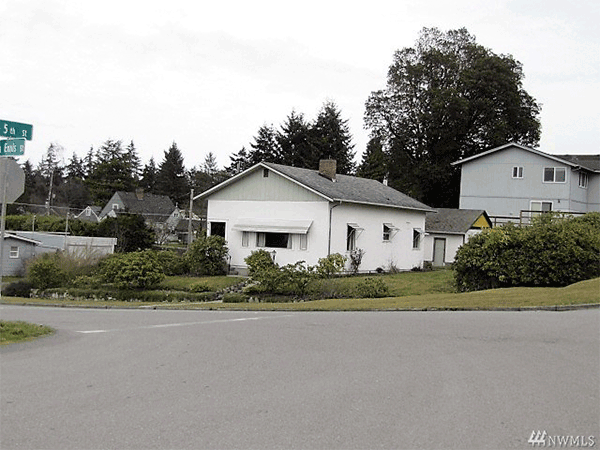 Duplex or condo lot ready for your investment and/or dream! 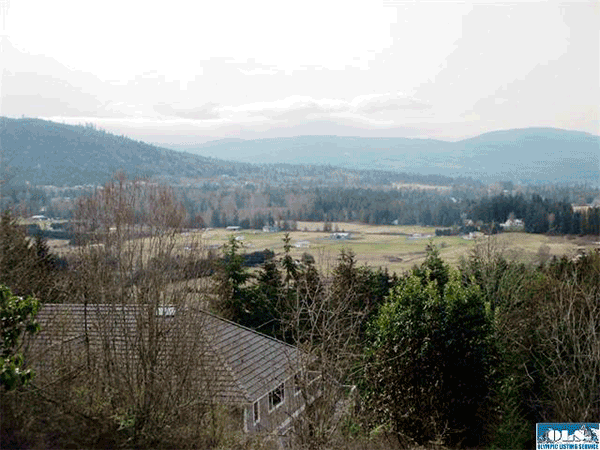 Over 1/3 of an acre with a great mountain view, this lot may be developed for a duplex or to sell units separately as condos. Power and water are to the property. 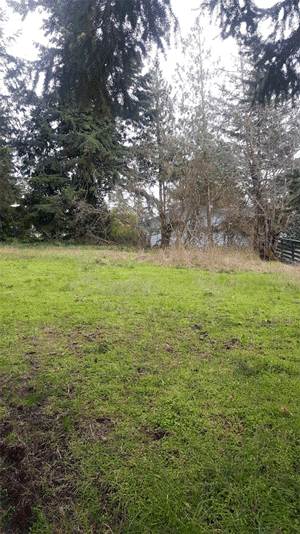 Will need pressurized septic system. 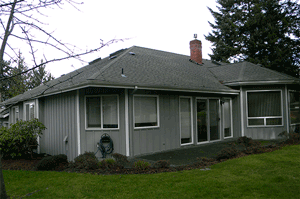 CCR’s allow single family residences also. Duplex–style condo lot located just outside the city limits with power, community waterto the property. This flat grassland 0.47 acre parcel is located just outside the city limitswith easy access to most anywhere in Sequim. 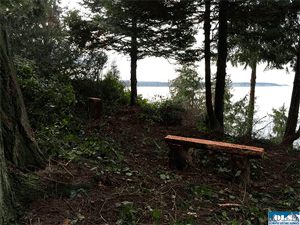 5 acre parcel heavily treed with 2nd growth timber, but with selective clearing, the view potential is excellent. 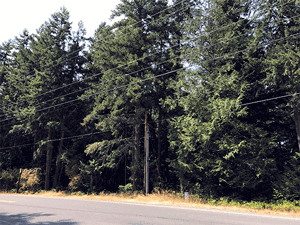 Protective CCRs, underground utilities, & gentle slope. 5 minutes from Salt Creek Recreation Area, 10 minutes from Freshwater Bay Recreation Area. Prime city lot with city water, sewer, irrigation on lot. 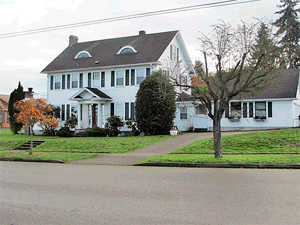 Corner lot with some views of mountains and the historic Spath farm. Walk 1 block to Carrie Blake Park without getting on a major street. Pre selling “phase B” of Willow Creek Manor due to finalize March 2017. 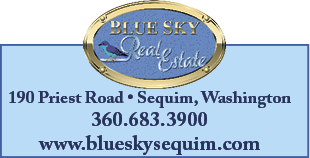 Short walk to Sequim shops just 2 miles to the John Wayne Marina, Hwy 101 and all beautiful Sequim has to offer. Phase B has 38 home sites. 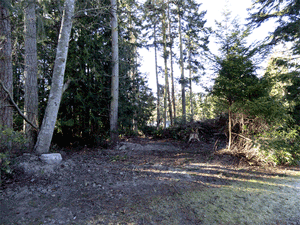 Great potential for a daylight basement home from this .61 acre lot with access to PUD power, city water and sewer. Land is forested and is a blank slate to build for privacy or cleared for maximum views! 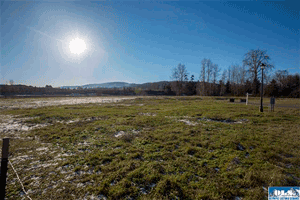 Beautiful flat grassland parcel located in the Agnew area close to the water. 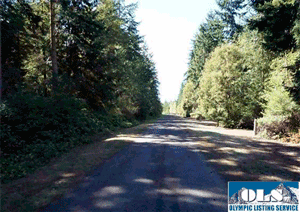 This easy to work with parcel has has paved road access plus power & phone to the parcel. 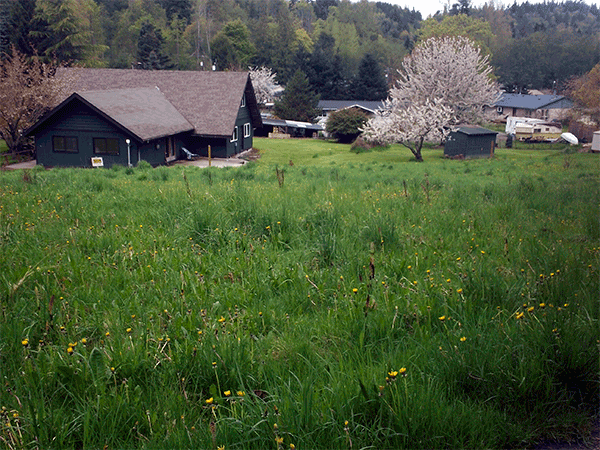 A well and septic system are needed. 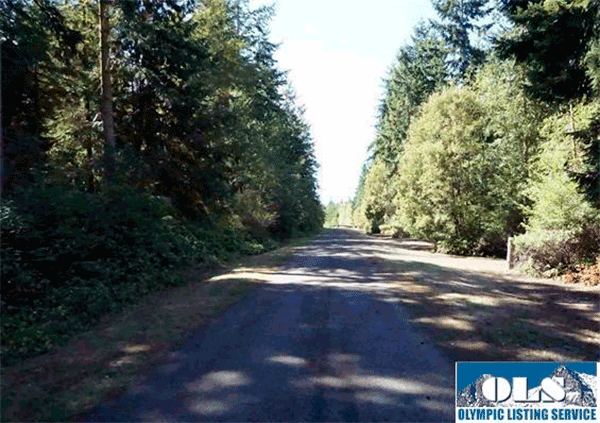 Beautiful views of the Olympic Mountain range through the trees from this 3.65 acre parcel. View could be enhanced with some tree limbing. 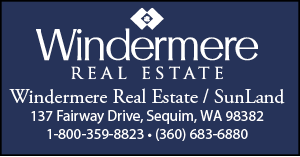 Convenient location between Sequim and Port Angeles. Site plan on file. Well and septic needed. PUD power in at the road. Great news – this parcel is outside of the WRIA 18 water rule! Copyright © 2017 Sound Publishing. All Rights Reserved.